La Bola is located in - you'll never guess - Calle de la Bola. It's hard to miss, because in the rather grey street, you'll find a very bright red facade. My boyfriend (A) and I walked in at 1 pm and it was empty (Spanish time), but we took a seat and the coming hour we watched loads of people walk straight to the 'back' of the restaurant. I thought it was staff or something, until I went to wash my hands only to discover two massive rooms which were also part of the restaurant. Don't let the tiny red facade fool you, this restaurant is BIG. La Bola is known for serving the cocido madrileno which is a typical dish from the region. It comes in a big pot, which consists of soup, lentils, two kinds of meat, vermicelli and some more vegetables (enough food to feed 2 actually). A really basic, wintery but filling dish. I opted for a grilled veal steak which tasted so much better than it looks, really delicious. I especially liked the combination of the veal with the warm tomato and red pepper sauce (which was meant for dipping the cebolla and little peppers). 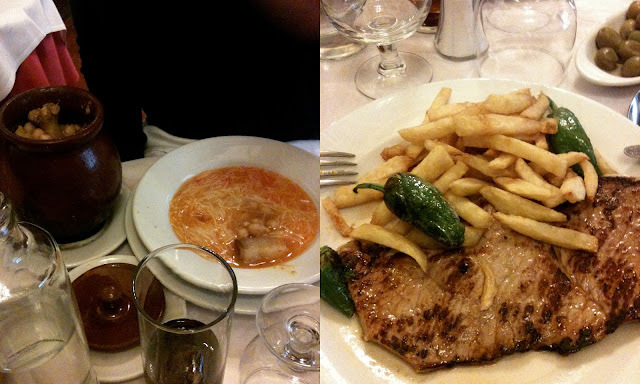 The fries and small green peppers were also very tasty. I was happy! Like I said, the sauce was very good but A and I both agreed that those tiny peppers tasted like soap, haha! The interior is quite classic and a bit old-fashioned. The walls are covered in frames with famous Spanish people who have been to the restaurant, like Rafael Nadal. It's quite a popular and well-known spot. Beware, they don't accept credit cards. I can hear you say "what??" and I agree. Restaurants nowadays that still don't accept cards, do those still exist? Apparently yes. It's a big downside because there is no cash machine close by, so bring enough cash. Overall, a very tasty and filling meal. 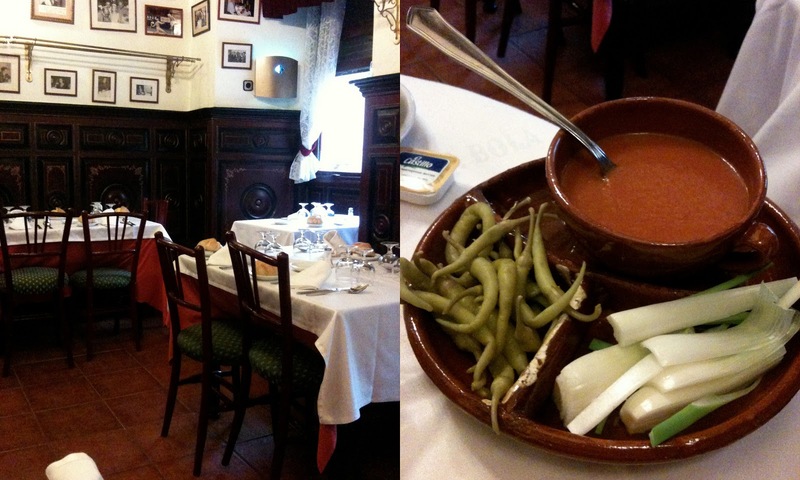 Maybe a tiny bit overpriced but still worth going to if you're looking for real Madrilenian food. I think that good restaurants don't necessarily need to have the most beautiful interior or the best service. Great food can be found anywhere.